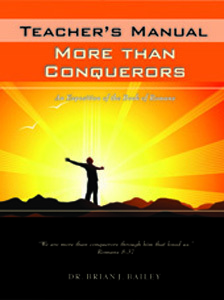 This teacher manual is based on the book Romans which is for those who long to be more than a conqueror. There is contained within the pages of this thought-provoking study a precious hope and assurance of what God is able to do in the lives of those who yield to Him. Dr. Bailey’s commentary on the book of Romans will enable readers to discover the richness of this masterpiece of Biblical literature and deposit within our hearts a hope and assurance that this same gospel of Christ can be established within our lives in order to achieve the ultimate goal - Christ in us, the hope of glory.